The Safe Place is a center where children can go to change their inner state from upset to composed in order to optimize learning. It is the centerpiece of your self-regulation program. A chair, beanbag, throw rug or pillow serves as a base for your Safe Place. 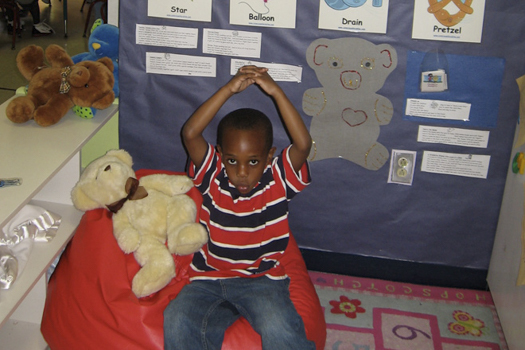 Fill the Safe Place with tools and activities that lead children through the five steps of self-regulation: I Am, I Calm, I Feel, I Choose, I Solve. The I Am step involves the initial upset when the child becomes the emotion. “I am angry!” The I Am Smock is helpful for demonstrating this stage of upset. The I Calm step requires active calming, featuring the four main breathing techniques, access to a Friends and Family book, and other calming activities. The I Feel step includes identifying the feeling with the Feeling Buddies or a Feeling chart. The I Choose step requires the child to consciously choose additional calming activities utilizing the Brain Smart Choice Cubes, I Choose Self-Control Board and/or class-made choice boards. The I Solve step involves the child solving the original problem before returning to work or play, often through the use of the Time Machine. 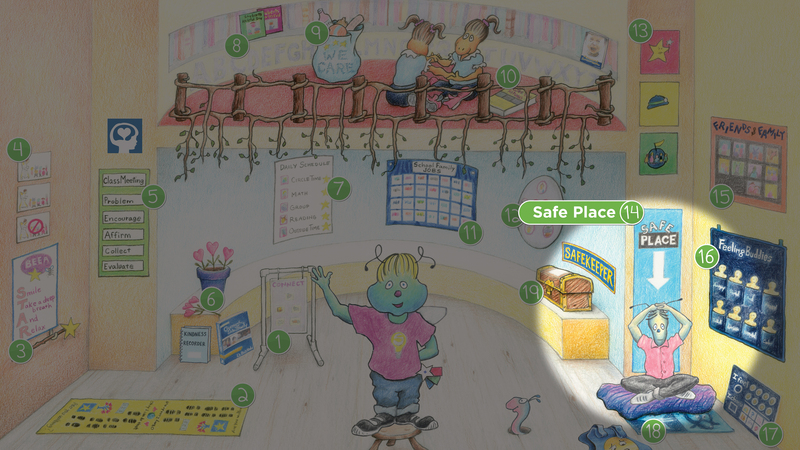 The Safe Place is discussed in detail, including activities and images, in Chapter 9 of Creating the School Family. There are many products that support the active calming process, such as the Safe Place Mat, Safe Place Poster Set, I Can Calm book and Calming Pillow Set. Helpful music for the Safe Place includes “Bye Bye Crankies” on Songs for I Love You Rituals Volume 2, “Snuggle Up” on Songs for I Love You Rituals Volume 1, “S.T.A.R. Song” on It Starts in the Heart, “You Can Relax Now” on Kindness Counts, and “Calm Your Brain” and “Safe and Calm” on Brain Boogie Boosters. The CLASSROOM EDITION: Feeling Buddies Self-Regulation Toolkit offers a comprehensive, advanced approach that teaches not only active calming strategies, but also the essential messages our emotions carry and the constructive inner speech that is crucial to the self-regulation of difficult emotions.